(Nanowerk News) Cartilage in our joints contains collagen which behaves a bit like the liquid crystals on a smart phone screen, according to researchers at Queen Mary University of London (QMUL). The collagen changes its crystallinity in response to physical forces, so the ordered arrangement in collagen molecules of the cartilage in our knees may be flipping from one structural state to another with every step we take. 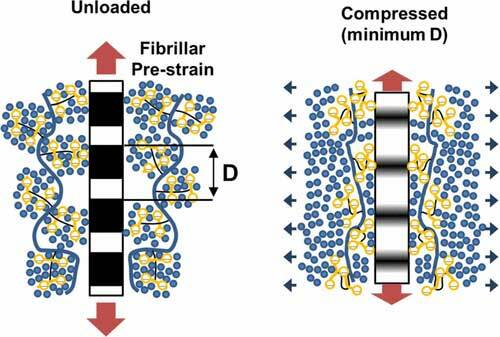 The results, published in the journal ACS Nano ("The Secret Life of Collagen: Temporal Changes in Nanoscale Fibrillar Pre-Strain and Molecular Organization during Physiological Loading of Cartilage"), cast new light on how cartilage is able to withstand the demanding mechanical environment of the joint and may eventually help to explain why cartilage breaks down with ageing or arthritis. Dr Himadri Gupta, from QMUL's School of Engineering and Materials Science, said: "Pain and reduced mobility due to joint diseases currently affects over 8 million people in the UK, the majority of these aged over 65. With increasing life expectancy, understanding how to ensure healthy ageing is extremely important." Co-author, Professor Martin Knight, added: "The response of collagen to physical forces is critical to the function of cartilage in our joints and therefore understanding this behaviour may help us develop new strategies to prevent cartilage degradation." Articular cartilage lines the end of our bones and helps our joints move with minimal friction. It also protects the bones by cushioning the forces in our joints when we walk, run or jump. But in painful disorders like osteoarthritis, the cartilage becomes less resilient and breaks down which leads to joint pain and immobility. Using a special, intense X-ray beam from the Small Angle Scattering and Diffraction beamline (I22) at Diamond Light Source, PhD student Sheetal Inamdar measured how the collagen fibrils, which are more than a hundred times narrower than a human hair, deform and change their crystallinity when cartilage is repeatedly squashed and allowed to recover with forces similar to those produced by walking or running. The fibrils are thought to act as a restraining mesh, holding a jelly-like material composed of proteoglycans which help to make cartilage resilient to repeated compression. The researchers found that the fibrils show a sudden reversible change in their crystalline ordering a short while after the cartilage was compressed and that this change is due to an internal rearrangement of molecules inside the fibril. This previously unseen behaviour of the collagen fibres was completely changed when the tissue is degraded as happens in osteoarthritis. The researchers are now seeking to understand the effect of repetitive activity and injury in ageing cartilage, and the implications for cartilage health.